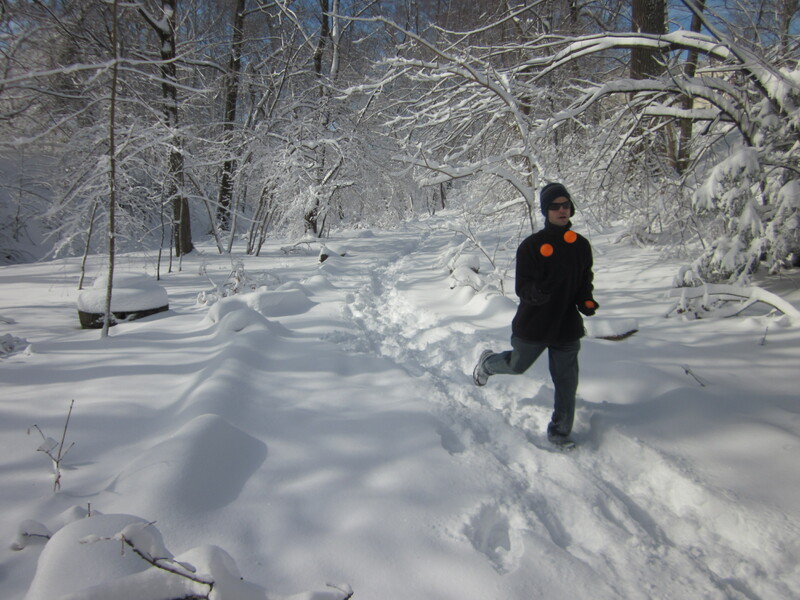 I hope my fellow jogglers, runners, and outdoor enthusiasts are having as much fun as I am having this time of year. 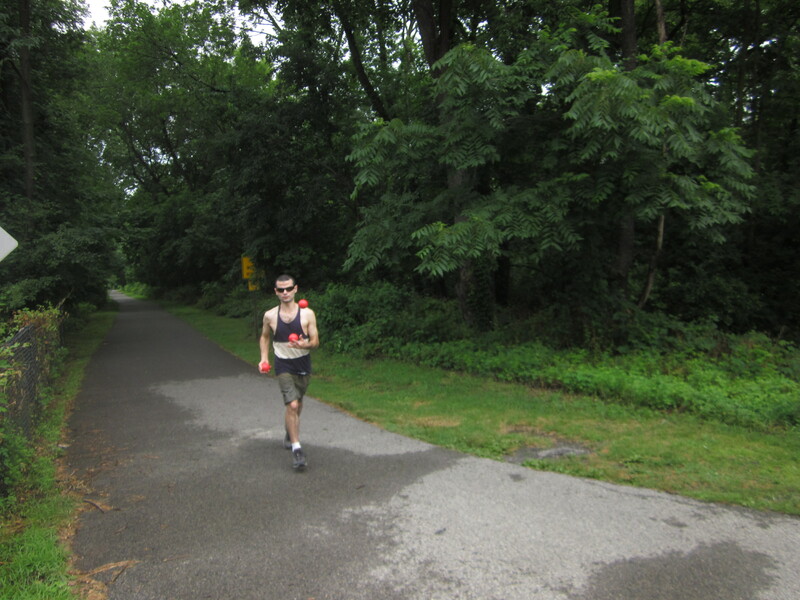 This run took place on Wednesday, June 5th. The magenta line in the middle, from south to north and then back south to Mount Vernon was my journey. I joggled about 98% of the time, except when I had a water break and a very short bathroom break in the woods. It took me 3.5 hours to complete this 18 mile run, and the last hour was pretty rough. 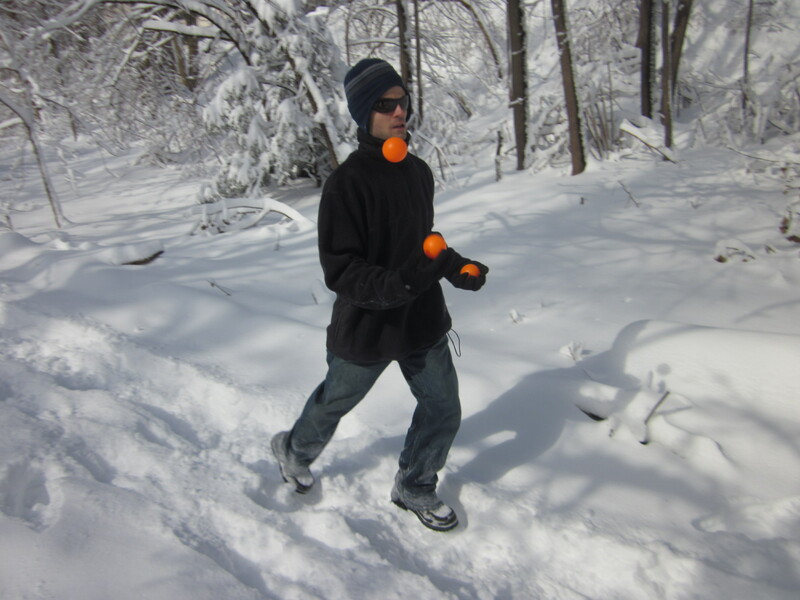 The juggling was so much easier than the running. 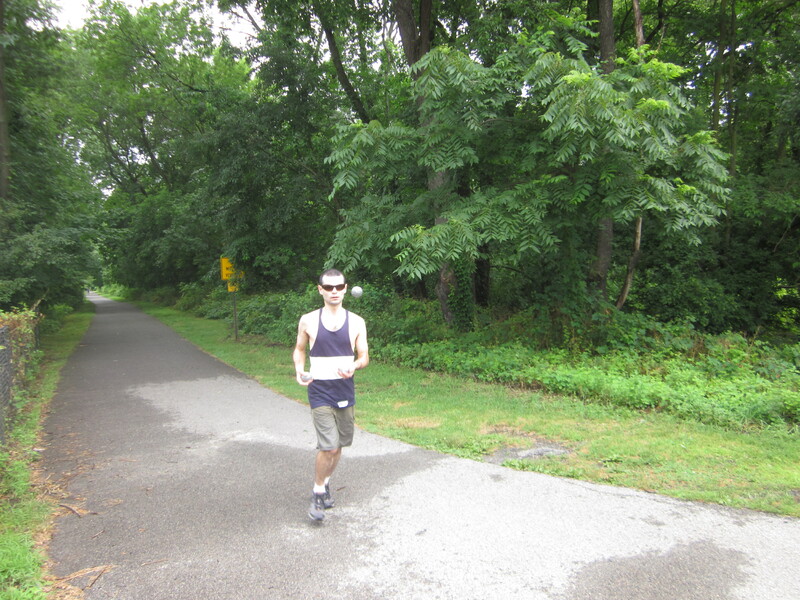 There were many hills along the trail and it was a sunny day, in the low 70s, so I didn’t sweat that much. I did some juggling tricks much of the way. 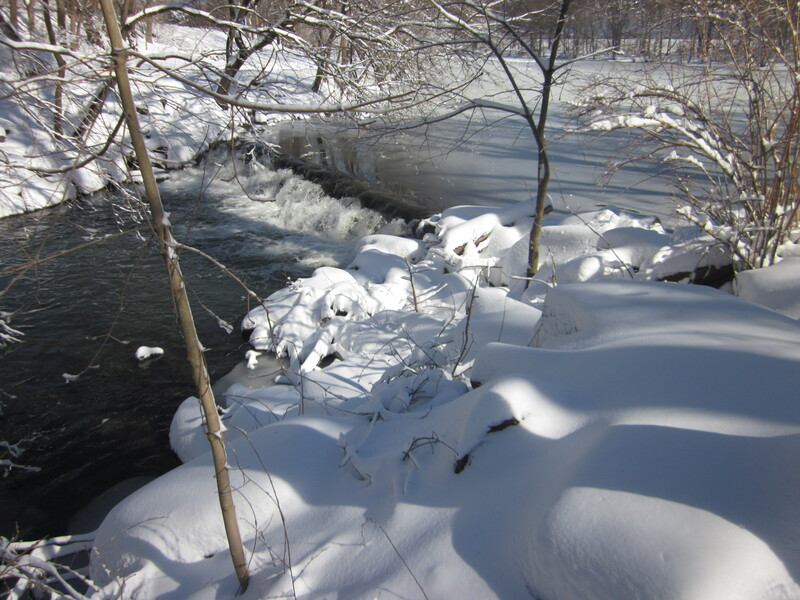 I followed the Bronx river for much of the run, but then the trail that runs along it terminates in Scarsdale, amidst a lot of construction, so I had to use route 22 to get to White Plains. I’ve been drinking more cherry juice during and after long runs, and this may have helped me recover to the point that I was able to run 3 miles the day after this 18 miler, and 7.75 miles today. Ordinarily, I just take a day off the day after very long runs. The soreness the day after this was pretty bad, but it is almost completely gone now. Remember, I don’t stretch before or after runs(scientific studies show it is useless, although I do a little back stretching and nothing else), and this may also be a factor in speedier recovery. I hope everyone is is having a wonderful spring so far, and that you all have a terrific Memorial day weekend. Today I managed to joggle for nearly 15 miles, much of the time in a thunderstorm. 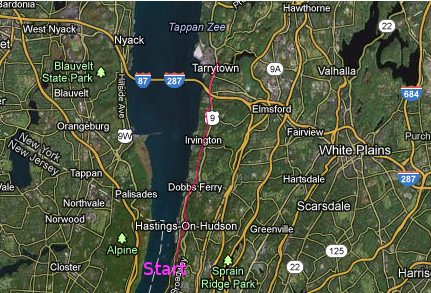 The above map of western Westchester county, New York, shows my crazy journey from the “start” at the bottom, following the magenta line(the Old Croton Aqueduct Trail) 7.6 miles north to Tarrytown, then back to Yonkers(I started and ended at the Lenoir Preserve). The first 45 minutes or so were pleasant enough since the weather was still mostly dry. It got worse a lot later. It eventually got so bad that I had to go inside a pharmacy for nearly an hour because of the frequency of the lightning, with one lightning bolt striking about 50 feet in front of me. It was really scary! Besides this, I was completely soaked, so my return journey took me a lot longer. The rain also made my smart-phone malfunction, so I don’t even know what my exact timing was. Not only was I soaked due to the extremely heavy rain, but I slipped on some mud in a hilly area and scrapped my hand. It got a little bloody, but there were no vampires around so I had little to worry about. 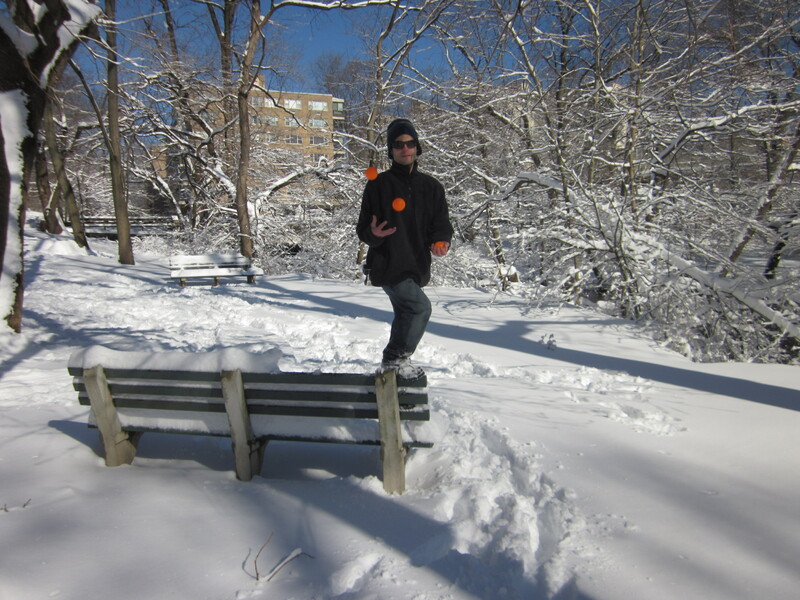 This didn’t compromise my juggling ability though. The mud, huge puddles, and rushing water(there was a flash flood alert for the area) made me stop juggling in some areas so I ended up running or skipping briefly. Still, I managed to joggle about 85% to 90% of the time. I did drop the balls a few times, ironically near the beginning of the run when conditions were still mostly dry. It’s funny how the lightning bolts, thunder, and heavy rain later on didn’t make me drop for the most part. Why do I do these crazy kinds of things? I guess I just love the challenge. I love to experiment. I like having nature as an adversary. Some of my best ideas come to me in difficult situations like this, so it is hard to resist. But just because I do it, doesn’t mean I am recommending it. You don’t need to do crazy things like me to stay fit. There is nothing “heroic” about what I do. I am under no illusion that I am some kind of “hero” – the coming Memorial Day is for remembering the real America heroes who risk their lives to keep us safe. I mostly had a spectacular time, though at times I did regret being out there during the worst of it. Sure, I am crazy, but don’t worry, you won’t be seeing any “Joggling 12 miles in Syria” posts any time soon. 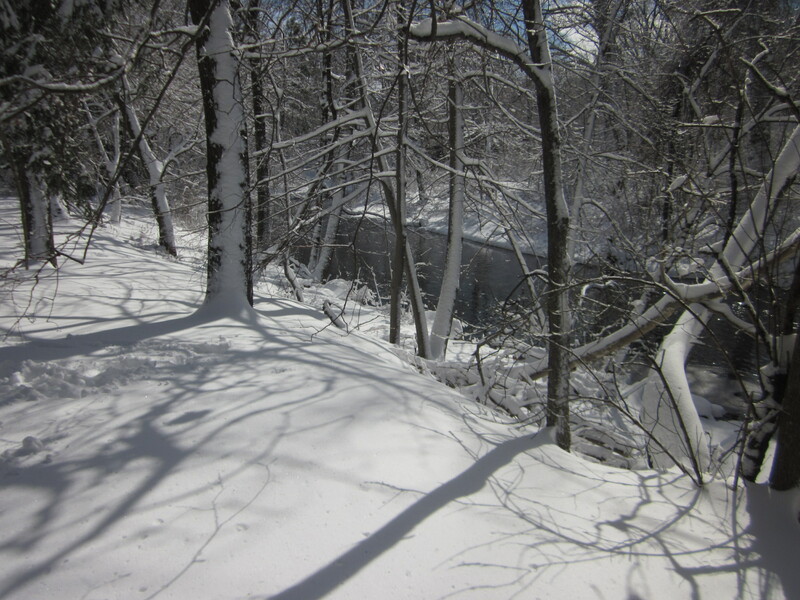 The big river that the trail runs mostly parallel with is the Hudson river. 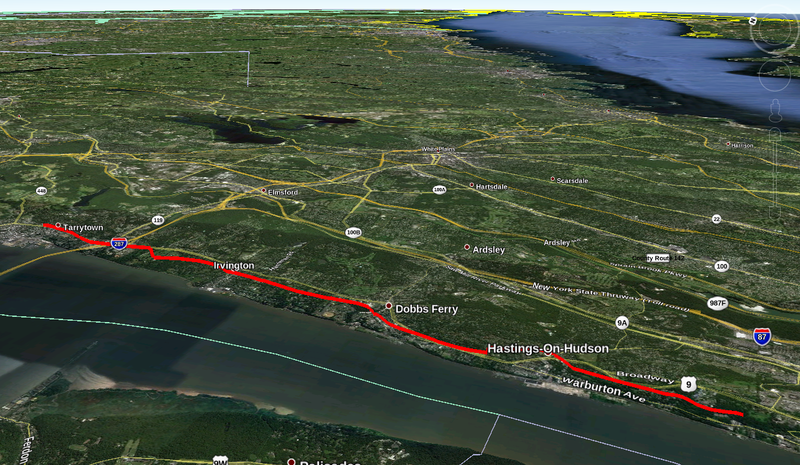 The run started in the lower right hand side of the map in Yonkers and went north to Tarrytown, then I turned around and ran back to north Yonkers. Showing the trail from even higher up. The red line in the middle was the trail run. 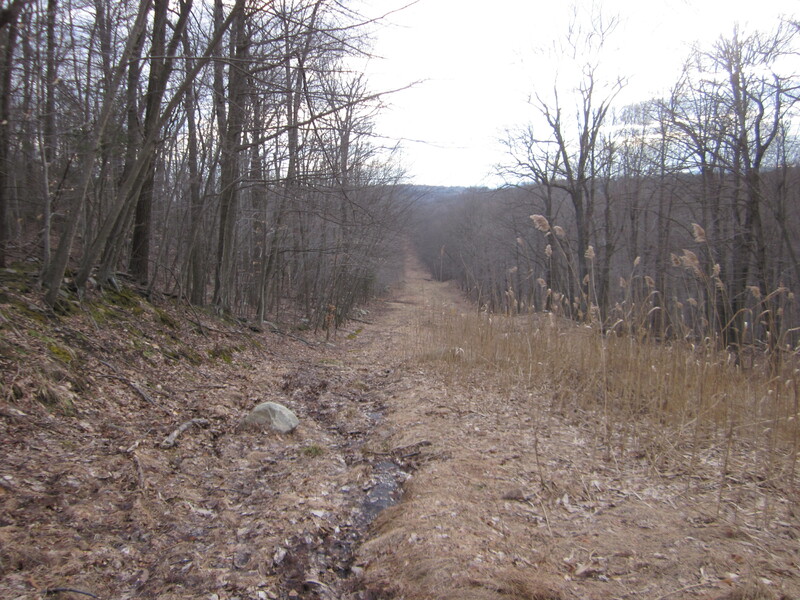 This shows that the trail is just a little north of New York City. 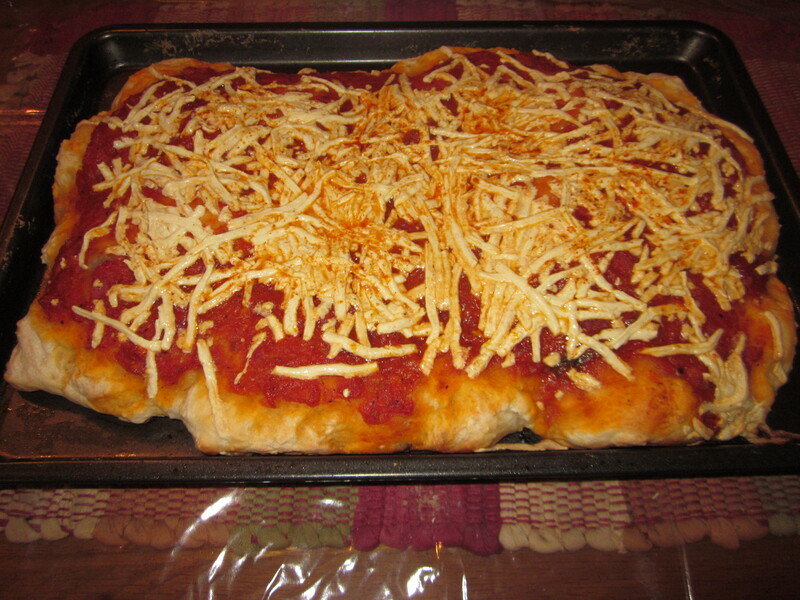 It was pizza night last night, and I wanted to try something new. 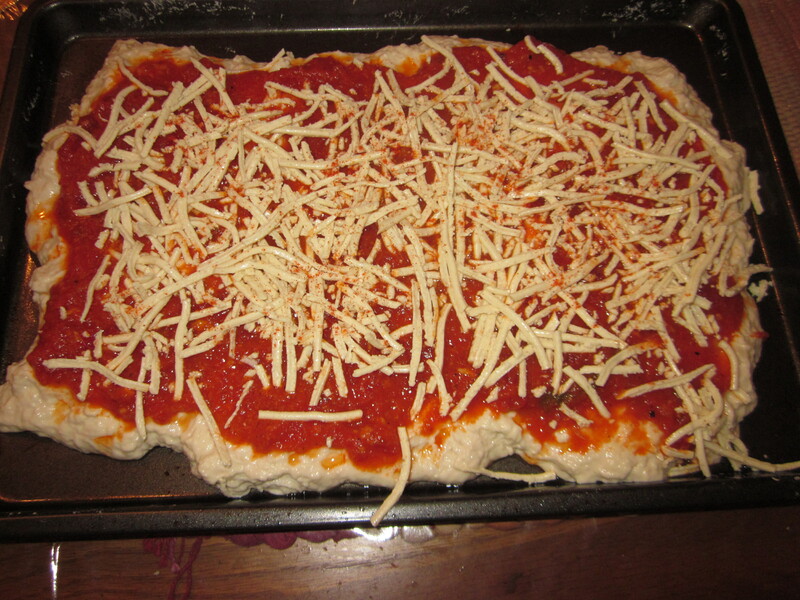 This is the first time I have ever used Daiya vegan cheese. 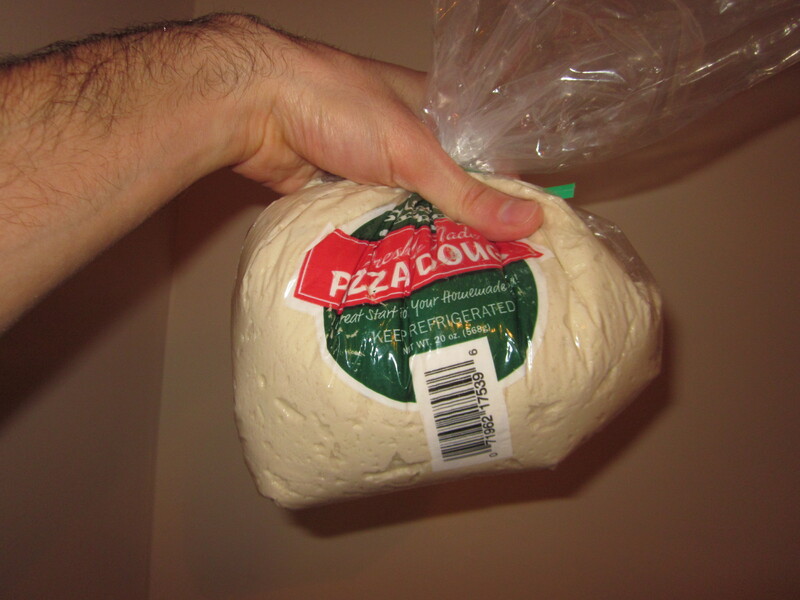 I used some pizza dough I got from the local Stew Leonard’s supermarket. I got the Daiya from the local health food store for $5.99, which is pricey so I won’t be getting this very often. The sauce I got was from the Stop and Shop supermarket, and I got the Stop and Shop brand(roasted garlic tomato sauce) which tastes very similar to the gourmet Rao’s brand pasta sauce, but less expensive than Rao’s. I added a dash of cayenne pepper since I love it spicy and put it in the oven for 20 minutes. Here is how it turned out. It was better than expected. Very yummy and filling. Vegan cheeses have come a long way over the years. Still, even some soy cheese alternatives often have added casein, a milk protein, which makes no sense. 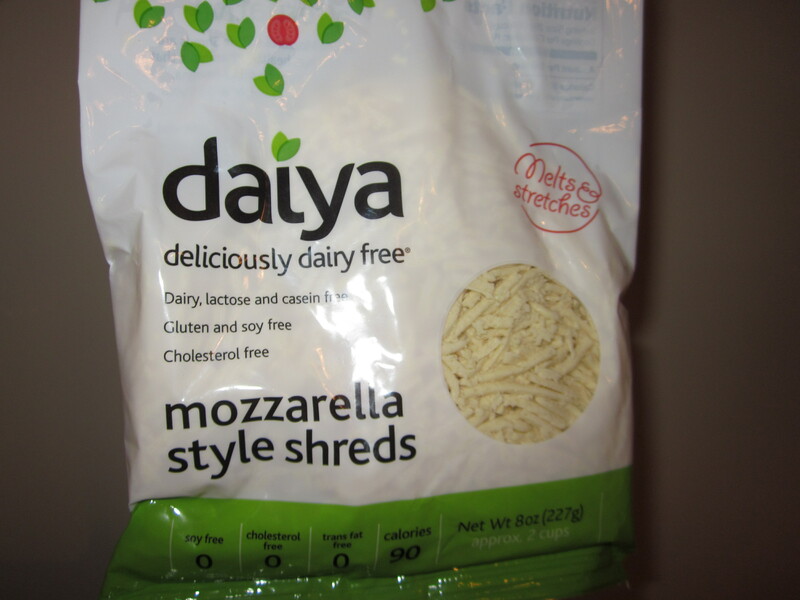 Daiya is 100% vegan, as well as soy and gluten free. 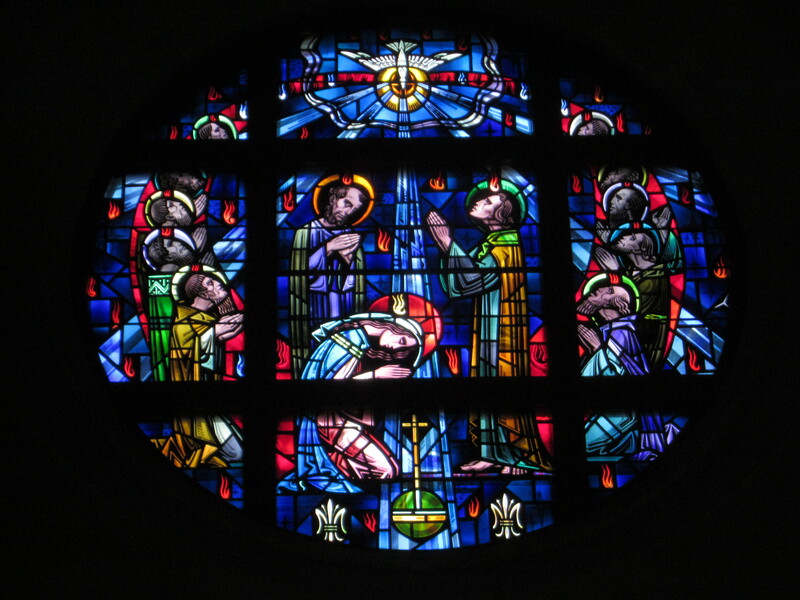 I am not a Catholic, or a religious person, but I thought it would be fun to visit the Mary Knoll Seminary/Museum in Ossining, New York on Easter, to see what was going on. I didn’t intend to take part in Easter mass or anything(it was over by the time I got there), but this place also has a museum and the building itself is an architectural marvel. 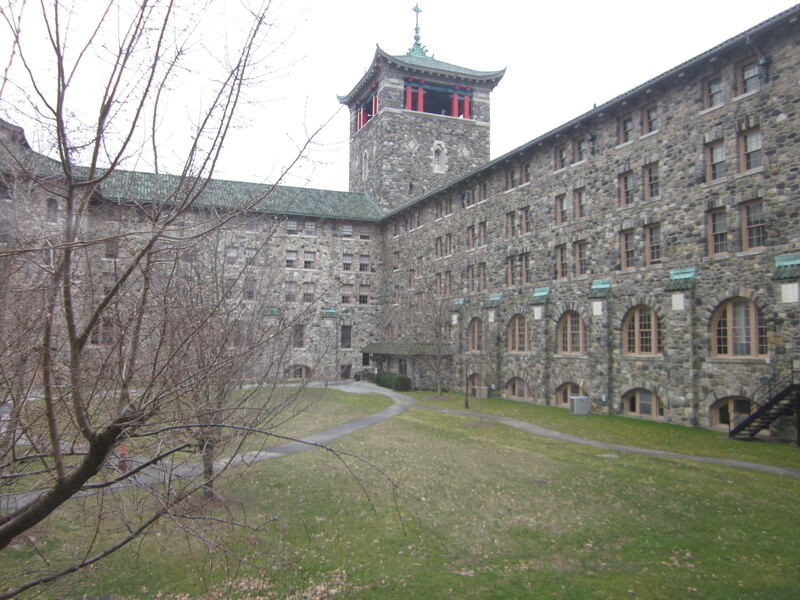 It is 38 miles north of New York City, located in picturesque countryside on a large hill overlooking the Hudson river. 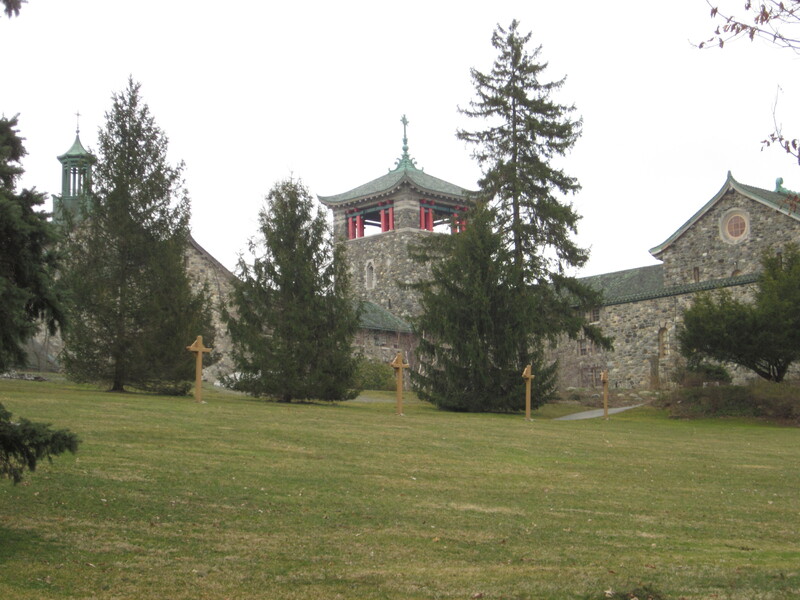 It’s built like a giant Chinese pagoda since this particular seminary’s original focus was on training priests to be missionaries in east Asia. 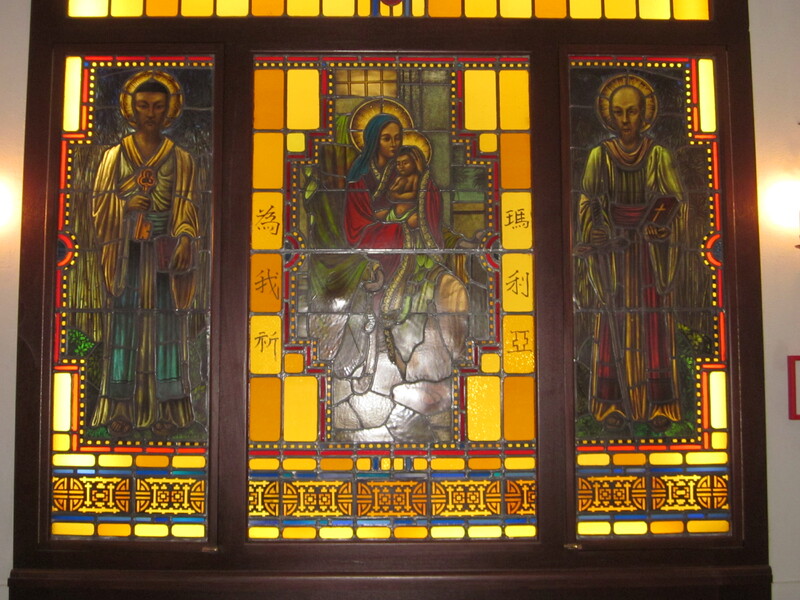 Even the Biblical figures in their stained glass icons often have east Asian features. 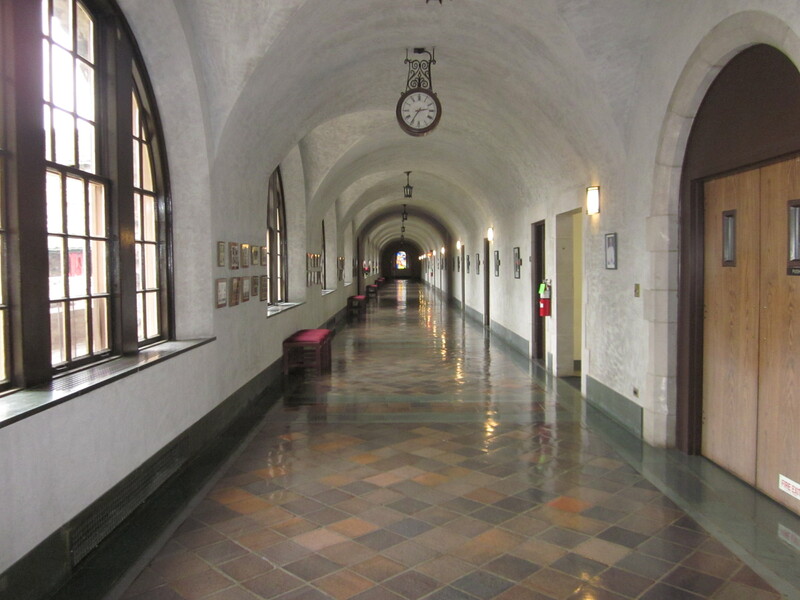 The walls along this long corridor commemorates the many Catholic priests who died in the various wars and conflicts in east Asia in the early 20th century. It was interesting reading about all the Christian missionary activity in Pyongyang, which is now in North Korea. North Korea has one of the most atheistic and repressive governments in the world right now. All the efforts of Catholic and other Christian missionaries in North Korea have been effectively erased by the communist government. Its government is once again making threats; technically, North and South Korea are still at war, but it’s been a while since there’s been any violent flareups between the two. Let’s hope it stays that way. A belated Happy Easter! (Unless you happen to be Eastern Orthodox). Spring is in the air! 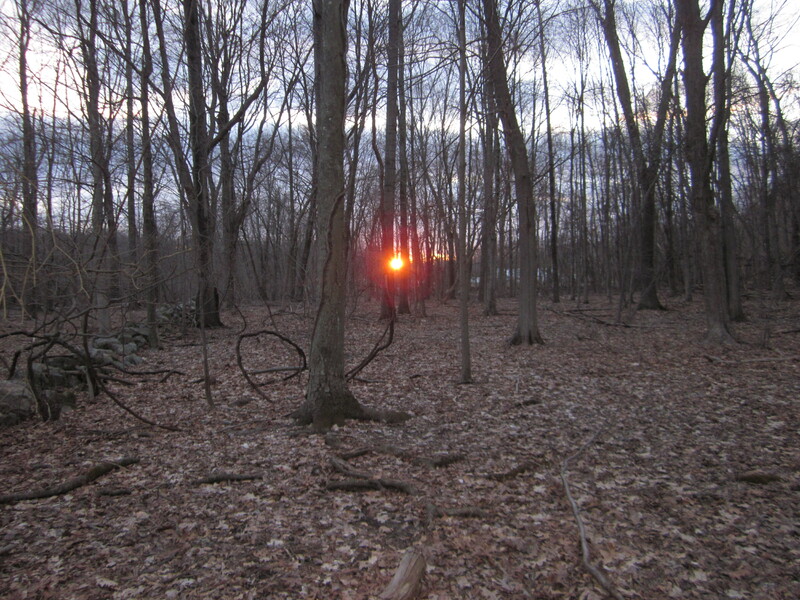 I had a fantastic time hiking at the Sylvan Glen preserve yesterday. 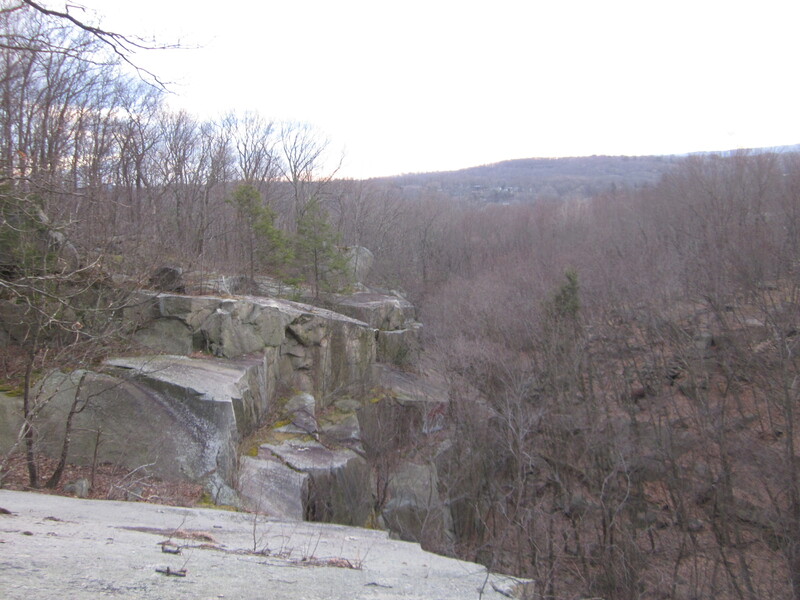 This interesting little preserve is in Westchester county near the Putnam county border. 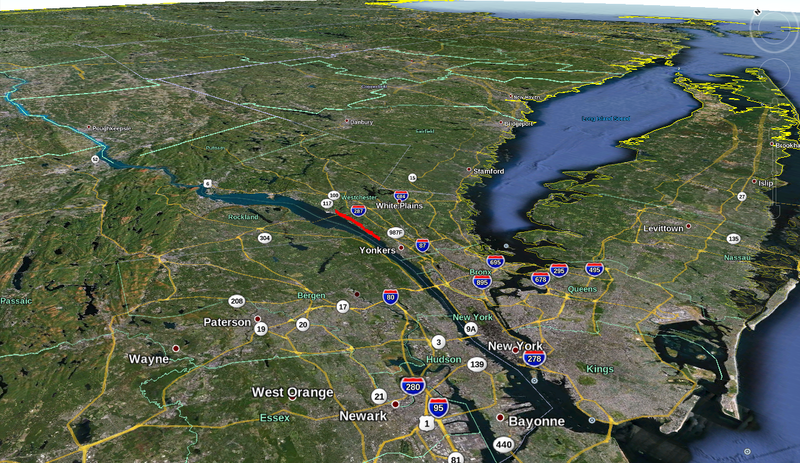 It’s close to Yorktown. I hiked about 4 miles with the hiking group I was with, which didn’t include any joggling since I did that earlier in the day and I didn’t want to distract anyone. You can get fantastic views in some spots within the park, but be careful. 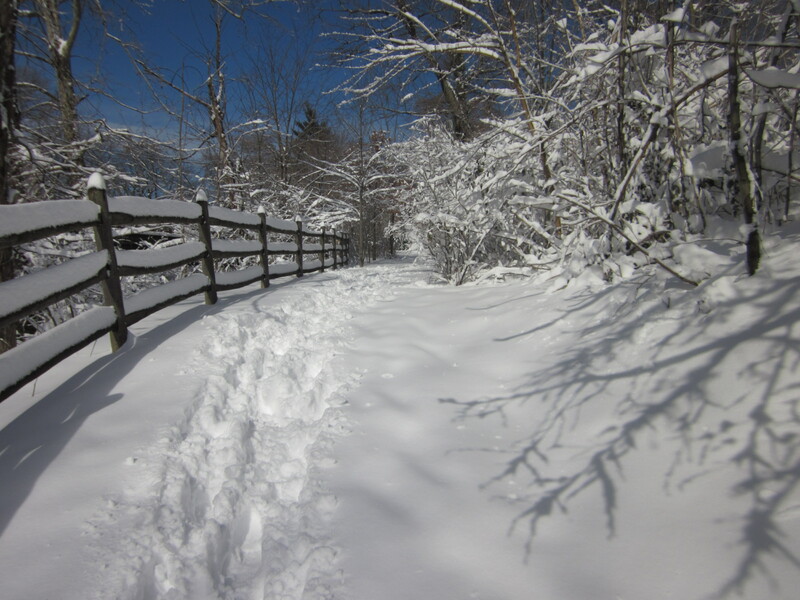 The trails in this park can get very steep in some spots, so you need to be in good shape to make your way through. The area near the gorge was once an important quarry. 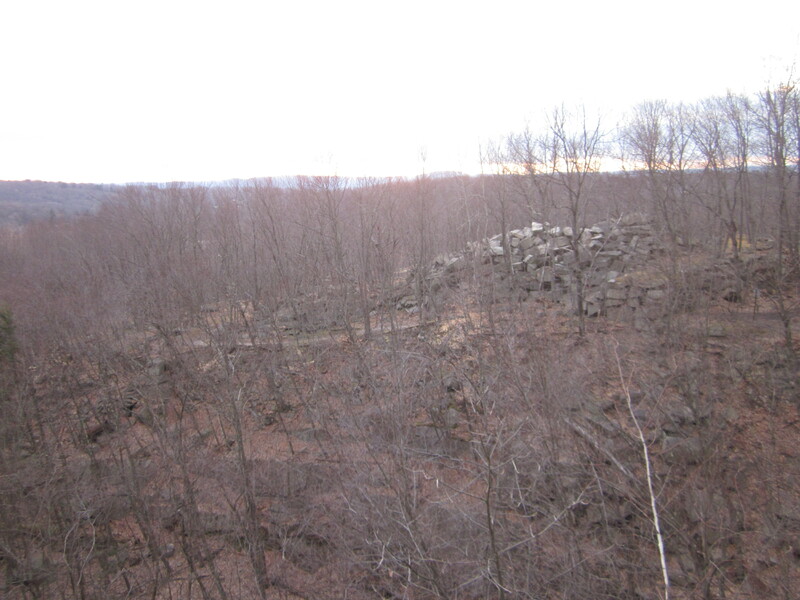 It has been abandoned for several decades, but there are still big piles of rock all over the place. 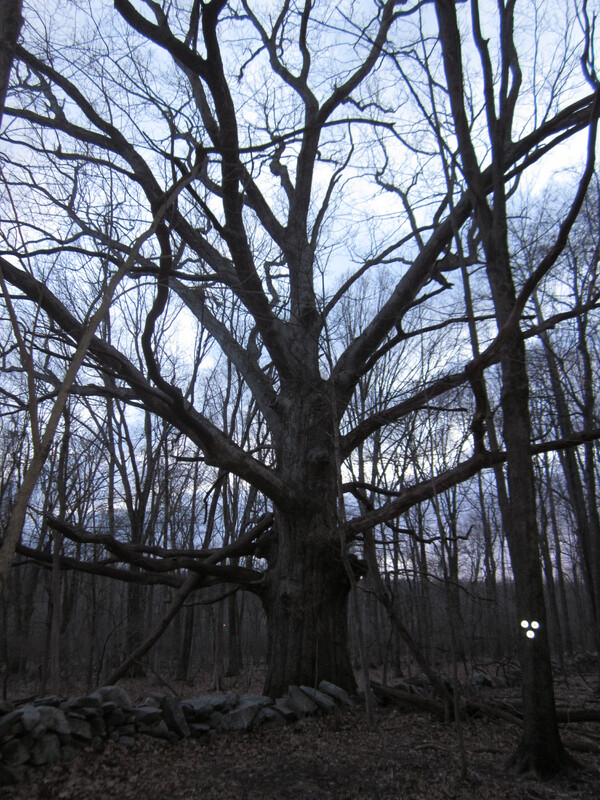 Sylvan Glen also has one of the oldest trees for miles around. This tree is several centuries old. It is probably a white oak, judging by the leaf litter around the tree. It’s been said by some arborists that oaks specialize in not specializing – hence, they grow almost everywhere. I hope this tree survives for another thousand years. 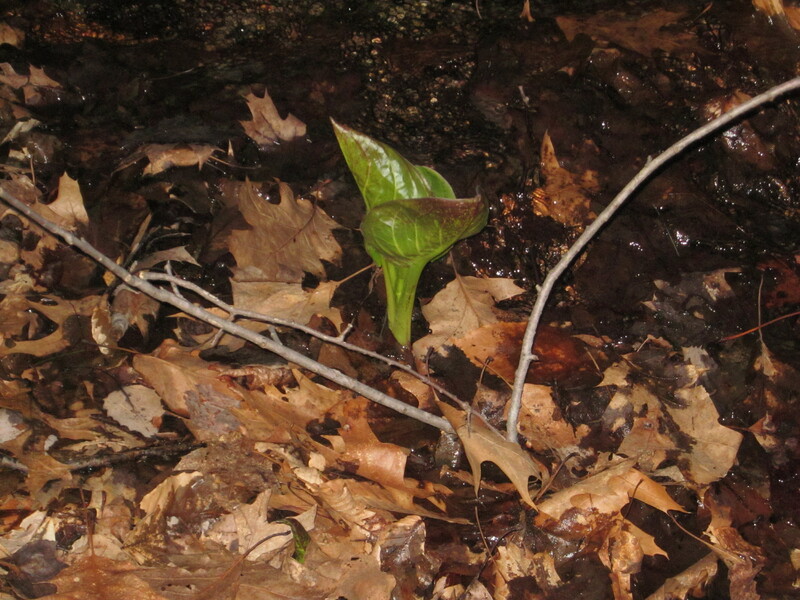 You know its spring when skunk cabbage(Symplocarpus foetidus) starts peaking through the ground. 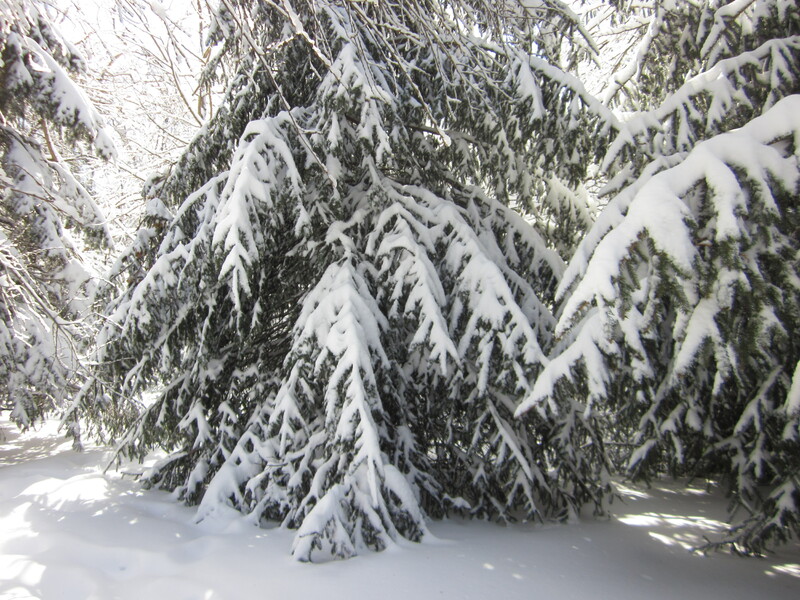 In the north-eastern U.S, it is very often the first green you will see in early spring/late winter. And yes, the plant does live up to its name. A couple of times I’ve been lucky enough to see spathes growing up through a thin layer of ice, the ice melted around the spathe in a circular form. This is an indication of skunk cabbage’s remarkable capacity to produce heat when flowering. If you catch the right time, you can put your finger into the cavity formed by the spathe and when you touch the flower head, your finger tip warms up noticeably. Biologist Roger Knutson found that skunk cabbage flowers produce warmth over a period of 12-14 days, remaining on average 20° C (36° F) above the outside air temperature, whether during the day or night. 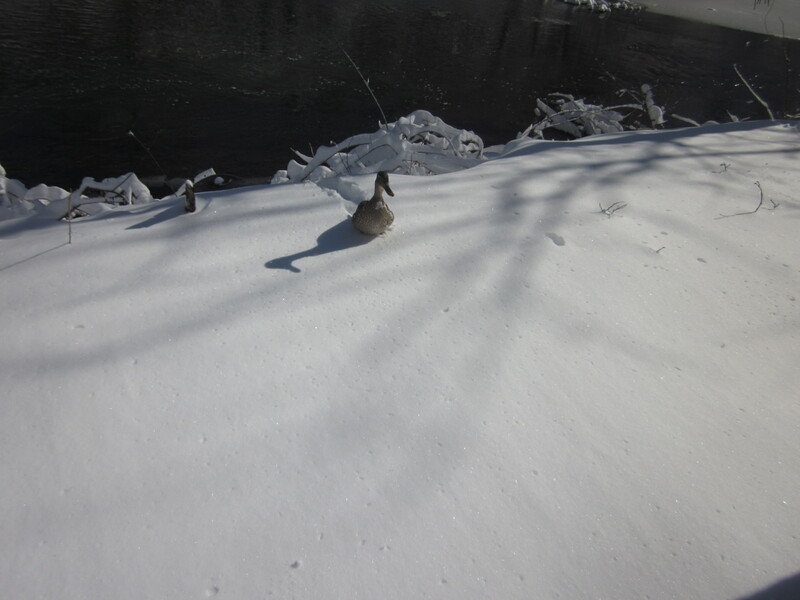 During this time they regulate their warmth, as a warm-blooded animal might! Skunk cabbage is at best marginally edible if you boil it in 10 changes of water and leave it to dry for a few days. In other words, don’t bother. Native Americans would only eat it when nothing else was available. If you try to eat it raw or with only a little cooking, the oxalic acid(partially responsible for the plant’s smell) crystals in the leaves will make you feel like you are having holes burned in your tongue. What is oxalic acid? Oxalic acid is a powerful anti-nutrient that can block the absorption of calcium, iron and other important minerals. Although spinach(and some other vegetables) doesn’t have as much oxalic acid as skunk cabbage, it still has a significant amount. This is one of the reasons I don’t eat much spinach(I prefer kale and cabbage), and strongly advice others to avoid juicing spinach. Cooking spinach can reduce its oxalic acid content, but it won’t eliminate it. The hike ended just after sunset. I had a great time with some very fun people, although we didn’t get to see much wildlife.